Shetland Ponies are the smallest of the British breeds, and unlike other pony breeds, do not increase in height when bred on more favorable land and in a milder climate. The early 1800s saw a demand for this breed from outside the Shetland Islands (Scotland) where it developed initially this was mainly for circus animals and children’s ponies. However, with the abolition of child labor in the coal mines demand grew even further and large numbers of ponies were sent to England for the mines. Buyers from the US had also become interested in the breed and large consignments were shipped across the Atlantic. In 1822 it was estimated there were 10,000 ponies on the Shetland Islands but by the 1890s this figure was down to only 4000. Today on the Islands there are approximately a thousand. With the increased demand and popularity, several stud books were established to breed ponies for use in the pits and for export. Interest grew, and in 1890 the Shetland Pony Stud Book Society was formed. Black is the foundation color but any color is acceptable. They have a relatively strong head with a broad forehead, large kindly eyes, large open nostrils and small neat ears. There should be a strong neck and muscular chest set on a thickset body, with a relatively short back, strong sloping shoulders, and strong muscular hindquarters. They should have good flat bones and muscular legs. 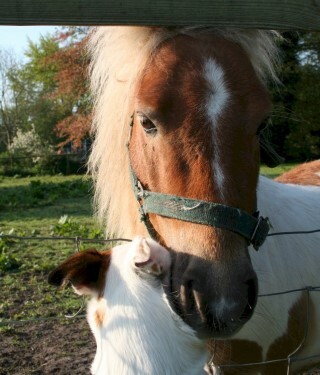 Shetland ponies have tremendous character and are not vicious and ill-tempered as people are sometimes led to believe. If a Shetland Ponies are treated sensibly, not teased or spoilt, they are a docile, wonderful pony for any child and they makes a tremendous driving pony for adults. Because of their small size, Shetland ponies are ideal for small holdings, and they bring hours of enjoyment to their owners, whether they be a child’s first pony or an adult’s show or harness animal.